It is enchanting, so much so that – every year, beginning in the fall – we get many, many questions about a multicolored star twinkling in the southeastern to southern sky after midnight. This star is Sirius in the constellation Canis Major the Greater Dog. It has sometimes called the Dog Star. Sirius is now rising in the southeast in the hours after midnight now and can be found in the south at dawn. Notice that a line from Orion’s Belt to points to Sirius. Sirius appears to flash different colors when it is low in the sky . . . really, all the stars are flashing different colors. That is because light is composed of all the colors of a rainbow, and the journey through our atmosphere breaks starlight into its component colors. However, you do not notice the colors of the other stars as much, because they are not as bright as Sirius, the brightest star visible from anywhere on Earth. Since our atmosphere is causing the light to break into its colors, and since Sirius is only visible low in the sky now (where you are peering at it through a thicker layer of atmosphere than when it’s overhead), the flashing colors of Sirius are very obvious when it is low in the sky. However, when Sirius is higher in the sky – which it is close to dawn . . . or in the evening sky in late winter . . . you will find that Sirius shines with a steadier, whiter light. 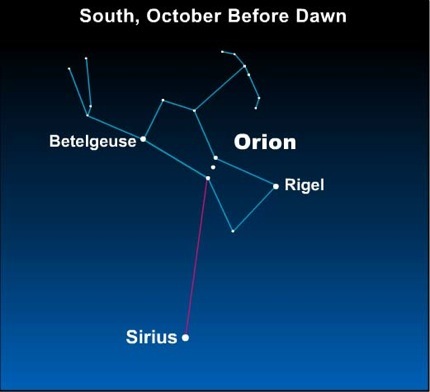 On these chilly October mornings, however, watch as Sirius winks at you in the wee hours before dawn! Site contents copyright © 2019 Recorder Online	except as noted. All rights reserved. | 87 queries in 1.159 seconds.